Asan organization’s IT infrastructure grows, so does the need to be able to deal with the growth in a quick and cost-efficient manner. One of the major requirements of modern business is to adapt internal IT infrastructure and business processes to new technologies such as cloud computing. Cloud computing means using IT infrastructure as a service. That service may be anything ranging from using third party APIs or renting new hardware. The first step organizations should take to make their infrastructure cloud friendly is to understand their basic infrastructure needs and decide which cloud computing infrastructure model they should adopt, depending on business size and needs. In order to get the most out of your cloud computing solution, it is important to have the right hardware and infrastructure in place. Your infrastructure is a way to deliver virtualization to your cloud computing strategy. For instance, you can run your cloud computing across the internet or on a local server. One very important requirement for effective use of the cloud is reliable, fast internet access, especially for smaller organizations that are using public cloud providers. Moreover, you need enough bandwidth so those who need to collaborate and work across cloud technologies are able to do so efficiently. Any organization that plans to adopt cloud services must decide which cloud computing infrastructure model suits its work processes.Organizations can choose to deploy applications on private, public or hybrid cloud. Organizations must take into consideration a number of factors before choosing a cloud model. For instance, an application needed on a temporary basis might be best suited for deployment ona public cloud rather than private because it helps avoid the need to purchase additional hardware. On the other hand, if an application is needed on a permanent basis and has a specific requirement, it is better to deploy it on a private or hybrid cloud. Public clouds are built to be shared by clients. They are owned and run by a third party where resources including storage systems, servers and networks are shared. Here, applications from different customers can be run simultaneously because the public cloud has that capacity. Essentially, public clouds are famous for their role in reducing customer risk due to the fact that a lot of security and performance measures have to be taken into consideration before they are implemented. Private clouds are built for the exclusive use of one client and they provide utmost control over security, data and quality of service. The company owns the resources and has total control over how applications are run. Such clouds are likely to be deployed at a colocation (a location where the company’s servers are located together with the servers of the cloud provider) facility and are managed by the company’s own IT staff. Hence, this model gives companies high levels of control. Hybrid clouds combine both private and public cloud models. Hybrid clouds have the ability to augment the resources of a public cloud and a private cloud in order to maintain high service levels in the face of rapid workload fluctuations. 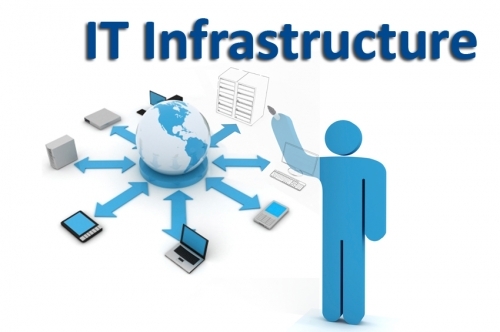 ► Infrastructure Preparation: What shouldbe done before Adopting Cloud Computing? Start by outlining the organization’s cloud computing goal. Benchmarking and gap analysis are effective tools you can use to know where your organization stands at the moment relative to your internal IT needs as well as the competition. It is important that enterprises know exactly what advantages they will accrue once they adopt the cloud. The next step is to spell out the organization’s cloud vision. Develop a cloud strategy or an execution plan by consulting a technology consulting company or with the help of your internal IT experts. The aim of adopting the cloud is to achieve greater business efficiency and agility. Therefore, it is important to understand your overall IT goals and how you will be able to achieve them through cloud computing. The organization must focus on automation because it is the central pillar to efficiency, scalability and agility. When businesses become automated, business processes take short time to complete and there is a higher level of accuracy compared to manual processes. You should train your IT staff or hire the services of highly skilled IT professionals to help you achieve your cloud goals. Knowing this helps organizations plan and put in place required infrastructure and IT resources to enable anefficient move to cloud. Size of the organization – This determines what cloud model to choose, the type of resources to acquire and extent of IT consultancy services needed. Bespoke Software -If possible, it is advisable to have customized applications and specialist IT resources to usher in the cloud. However, if you are a small start-up, there may be no need to purchase any software at all at first as you can make use of the free available web apps such as Google drive or Microsoft’s new Office 365 suite. Backup and Disaster Recovery – Have a proper backup and disaster recovery process so that if something goes wrong, you can get back on your feet on time. This can be in form of secure storage or signing up with more than one cloud provider to ensure data redundancy. Due diligence -Due diligence needs to be carried out at the beginning of the planning process because there will be little opportunity to rollback in case of inefficient deployment. To avail thetremendous benefits that result from adopting cloud services, it is important to ensure you have cloud friendly infrastructurethat helps you achieve reliability and efficiency in business processes. This can be achieved by critical evaluationas to which cloud infrastructure model toadopt, based on your business size and objectives.